CHICAGO (AP) — Patients who delay getting treatment and insurers who balk at paying for it are among job stresses that Chicago nurse Ben Gerling faces on a semi-regular basis. So there was no tail-dragging when his employer offered a few four-legged workplace remedies. Gerling and dozens of other nurses, doctors, students and staffers flocked to a spacious entrance hall at Rush University Medical Center after learning about special animal therapy sessions the hospital has organized. Three huggable pups named Rocco, Minnie and Dallis greeted almost 100 white-coat and scrubs-clad visitors at a recent session, happily accepting cuddles, ear rubs and treats. Big grins on the human faces suggested the feelings were mutual. Minnie, a fluffy white and gray Labradoodle mix, had "the softest fur I'd ever felt, like a little cloud," Gerling said dreamily as he headed back to work. Many hospitals use animal therapy for patients — Rush has even brought in miniature horses. And many workplaces allow pets on site to boost employee satisfaction, but heelers for healers offers a different twist. The medical center has held the monthly Pet Pause sessions for over a year, using dogs from a local shelter and an animal therapy group. Recently, Rush nurses launched a study to see if the program has tangible effects on employee stress. Research in other settings has shown benefits from interacting with animals, including lowering stress hormone levels, blood pressure and heart rate. Early indications are that it may have similar benefits for hospital workers. In the study, the human visitors get blood pressure measurements and fill out questionnaires rating their stress levels before and after the canine cuddle sessions. "My blood pressure was kind of high when I came in, and it was lower when I left by about 10 points, so that was good," he said. Melissa Browning, a Rush nursing director involved in the study, rattles off a long list when asked about what makes hospital work particularly stressful: constant beeping from medical device alarms, dealing with gravely ill patients and worried families, triple checking the accuracy of patients' medicines and doses — it can all add up, Browning said. For Benjamin Gonzales, a graduate student in health systems management at Rush, the heavy course workload can be taxing and he called the dog session a welcome break — even if his blood pressure was a little higher afterward. "I could feel the big sighs coming out of me when I was with the dogs, so I know that just coming to this has made my day less stressful," Gonzales said. "This is amazing. I wish it could be every day." A management professor emeritus at Virginia Commonwealth University is among researchers who have found improvements in employee stress, satisfaction and productivity when dogs are allowed in the workplace. His name is Randolph Barker and he laughs that maybe he was destined to study the topic. His research was at a dinnerware company but Barker said there's no reason to think hospital workers wouldn't gain similar benefits. Dogs can potentially serve as a "low-cost wellness intervention," Barker said. 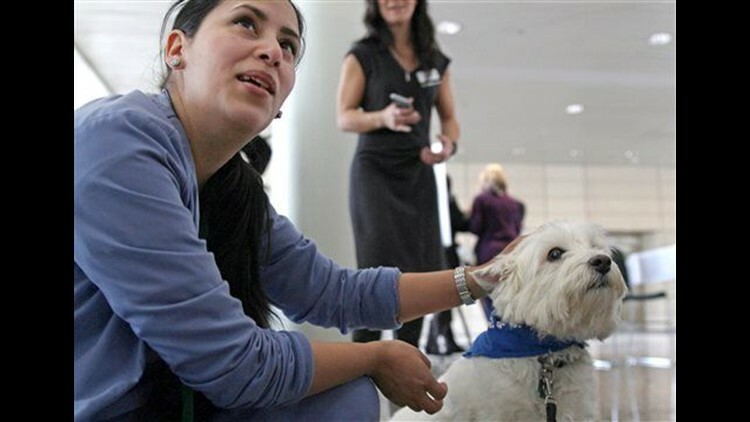 The "pet a pooch" program for staffers at University of Pennsylvania's hospital inspired the Chicago program. Emergency room nurse Heather Matthew started the Penn program three years ago, bringing in dogs from local animal shelters. Besides boosting morale, Matthew said there's an added bonus — Penn hospital workers have adopted more than a dozen shelter dogs involved in the program.